Salads and sautes with simple sauces, dressings, or spices are so versatile - they can be mixed with meats, eggs, tofu, or other types of protein as stir-fries; tossed onto spinach or lettuce as a salad; topped onto bread or in wraps, or even just used as side dishes. This week, I've been really into the vibes late summer brings us. Hints of crisp fall mingling with the warm, lazy days of summer all combine to create a lovely, cozy atmosphere. As such, I decided to mix in the refreshing, vibrant summer and fall tastes of balsamic vinegar with asparagus, pears, onion, and cinnamon to create this dish. During the week, I will toss it over some spinach and will top it with grilled chicken, feta cheese, and almonds for a comforting salad! Dab a little olive oil onto a paper towel, and lightly rub onto a skillet. Heat the pan on medium heat; once the pan is hot, toss in the pear, asparagus, and red onion. 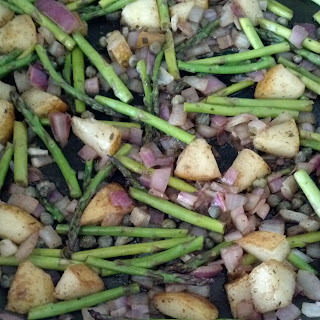 Saute until the onion and asparagus begin to soften. Meanwhile, combine the capers, caper juice (imagine drinking a glass of that! ), balsamic vinegar, salt, cinnamon...in my case, lots and lots...and pepper. Toss the dressing into the skillet and mix all of the ingredients together. Continue to heat until the liquid is absorbed, right before the pears become mushy. Remove from heat. Either serve warmed as a side dish, or toss with spinach/lettuce of choice, chicken, feta or goat cheese crumbles, and almonds!